Compared to me, the seven seas are smaller than a tear. A moment is like a century or else ten thousand billion years. I’m older than the universe, and larger than the sky. Every creature has known me from birth until they die. I’m loved by everybody yet I’m hated desperately. There's not one single person that hasn't talked to me. So tell me all your secrets and I'll point no hand of shame. Regardless of what your conscious says, I won't hold you to blame. Yes, share with me your sorrows, with me you can be bold. I’ve heard it said that confession is a tonic for the soul. No power could ever move me (I mean no power) to tell one single word. Because my name is "Silence" and Silence is never heard! 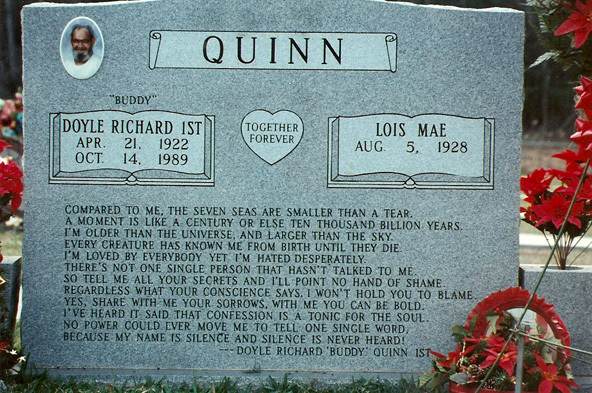 In tribute and with my love for my Father "Buddy Quinn" whom went to live with our Lord on Oct. 14, 1989 I recorded "Silence" which is one of his many writes. My Father was my friend, my mentor, the man that put the grit in my bones, the gravel in my guts, taught me right from wrong, gave me the heart to help others, the determination to win, the power to succeed and taught me that love is simply TRUST! Even though it has been many years ago that my Father left this earth I still talk to him everyday. I guess I will till the day I move on. Thanks for taking the time to view this page! 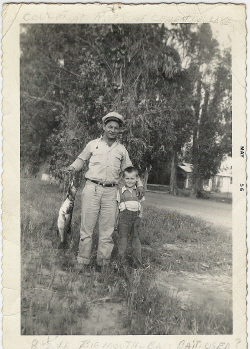 In this photo (May 1956) I was six years old. My Father worked for Riverside Cement in Bloomington, CA.